KfC was pleased to sponsor the Read, Write, Review! program as part of Calgary’s writers festival, with five authors involved in presentations at Lord Beaverbrook High School. As part of that, the blog is featuring student-written interviews with each of the authors — this one was done by Samantha Vu. 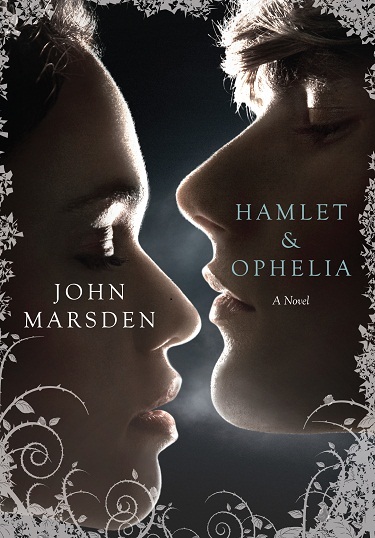 On October 13th, 2011 I had the honor to interview the incredible author of over 40 novels – including his latest Hamlet and Ophelia (a modern, highly readable, adaptation of the Shakespeare play) – John Marsden. Lord Beaverbrook High School and Calgary International Wordfest 2011 provided the opportunity for John Marsden to give a speech to the students of the school as a part of his tour. On the theatre stage right before his presentation, my accompanying teacher introduced me to Mr. Marsden. After we said our “Hi, nice to meet you,” I knew in the next hour I was in for a treat. I enjoy talks; hence, I watch so many of those TED talks. But when I got to experience the speaker in real life, let me tell you, it is even better. As the classes filed in there were some grade 12 students that sat behind me a couple rows back, the exact words they said upon sitting down were “I’m just going to sleep right through this.” Let me just say that was not the case. As soon as Mr. Marsden started, these kids were the ones clapping, laughing and commenting all throughout the performance. Hearing his speech was really remarkable; his life and the events he shared with us were interesting; and the stories that we were told will definitely stick with me for a long time. He taught us the beauty of words, the abstract use of language, and how to turn a dreaded F into a decent B – in less than three minutes. If you were there you would have laughed along with us and left with a smiling face. Afterwards, I sat down with Mr. Marsden and asked him a few questions about his life and career. Samantha: What inspired you to start writing? John: I started to write mostly for the love of stories, the love for language, and I especially like how I can express myself through my work. Without a doubt I am musical too, and my love for that plays a part as well. Samantha: When did this passion start? John: It really started in my grade 4 elementary class in Australia. I realized my love for writing as I wrote for my school’s newspaper. I received a lot of positive feedback from my friends and it helped support me and kept me motivated. Samantha: What was your high school experience like? John: I didn’t have a pleasant high school experience. Honestly, I was bored out of my mind most of the time. What I had to learn was so traditional and stupid. Samantha: Did you know you were going to write books when you were in high school? John: You never really know, it just turns out how it does and I’m glad it turned out like this. Samantha: How did your first book come about? John: Before being an author, I was a teacher and, in a school that I was teaching at, I went into the library and looking for new books for my students. Nothing I saw really sparked an interest or demanded my attention, so I decided to take a leap of faith and write my own. My goal was to get my students to read more and enjoy it, and they did, because it is cool to read a novel written by your teacher. The first book I published was in 1987 and called So Much To Tell You. This book won many awards at the time, but I kept writing. Samantha: How did it feel when your first book got published? John: It felt bizarre, like a dream, like all my dreams had come true. Samantha: What do you want to write about most? John: My novels are mostly about people overcoming their own difficulties. One of my goals is to never have a boring sentence in any of my books. I want a complete stranger to flip to a random page and be able say, “Wow that is one great sentence!” I also enjoy writing about tragedies and reading about them as well, some of my favorites are from Shakespeare. Samantha: How long does each book take to write? John: I’d say it takes 4-8 months, approximately. My latest novel Hamlet and Ophelia took only 12-14 weeks. I can’t work in areas like Starbucks or other coffee shops. Most of my work is done in quiet, boring, secluded places — hotel rooms are a good example. Nothing very productive can be done in a hotel room alone, aside from watching television and eating, so it’s the perfect conditions for a good writing environment. Samantha: What is the hardest aspect in writing you stories? John: Motivation, without a doubt, the beginning is great, you are all motivated and exited about starting a new story, expressing yourself etcetera, etcetera. But then as you reach the middle portion the excitement has slowed down and the only driving factor to get you through is the thought of completing a new book. Be careful to not make writing a chore or something you have to do, make it something you want to do, so when it is finally done, you want it to feel like it has been worth your time. Samantha: What is your advice to students who want to pursue writing as a career? John: Just go for it, live your life and if it happens it happens. All the true writers will emerge no matter what, their passion, their love, will never stop them and even if they get rejected a few times they will bounce back and continue to write just for the heck of it. If you are serious about pursuing writing then always keep in mind that if you don’t care for the fame and money, and care for the writing content instead, then you will always make it farther. Overall, I have to say that this is one of those days worth remembering — from the presentation to the interview — I am so glad I was given the chance to meet John Marsden. He was extremely kind and talking to him was made so easy, plus who knew that you could learn so much in such a short time with someone. It was a pleasure to meet an author who is as smart as Mr. Marsden. Plus, he was even kind enough to sign a copy of my own Hamlet and Ophelia. I can see myself in the future reading more of Mr. Marsden’s books, and I don’t want him to ever stop writing because he is such a great writer and such a great person. I want to close by saying (directly to Mr. Marsden): Thank you for coming to our country and our school, and taking time out of your life and away from your family, to talk to us at Beaverbrook. Also, you made a difference in my life, and I am inspired to keep writing.